Valuframe - Aluminium Extrusion Suppliers UK. Aluminium profile suppliers for engineers. With Valuframe we set out to be aluminium extrusion suppliers of the most versatile, cost effective system for creative engineers. Our value for money approach has been very successful and now Valuframe profile systems are used in many and varied applications. If you already have an aluminium profile supplier, maybe it's time to look at Valuframe. 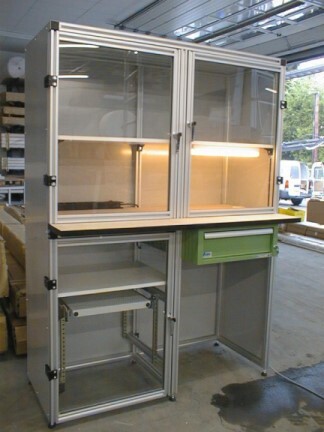 Valuframe profiles are available in 3 series and these series are denoted by the slot width and the "Core dimensions". 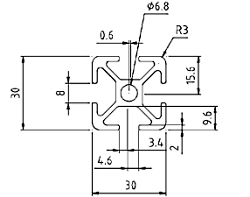 The core dimensions are the base outer dimensions and the pitch of the aluminium profile slots. Other aluminium profile suppliers have the same or similar layouts, but Valuframe combines great choice with competitive pricing. There are 3 different slot widths available, 5mm, 6mm and 8mm and generally, the wider the slot, the larger and more robust the profile. There are 3 core dimensions, 20mm (Based on 5mm slot), 30mm (Based on 6mm slot) and 40mm (Based on 8mm slot). As leading aluminium extrusion suppliers, we can help you with the selection of your core system. It's possible to have more than one core system in one frame as there are connectors that can adapt from one system to another, but generally it's easier to keep to one core system to minimise the types of connectors and parts you need. Series 5 aluminium profiles are generally based on 20mm core dimensions, with a 5mm slot that allows a maximum slot nut thread of M5, these aluminium extrusions are used for small, light applications such as sensor supports, small doors, frames and enclosures. There are other profiles in this series including flat face versions. The system has it's own range of ancillary parts such as hinges, handles, slot nuts and connectors. Because the aluminium profile slot is 5mm, the maximum thread size you can use with this aluminium profile system is M5, therefore it is not suitable for heavy applications. 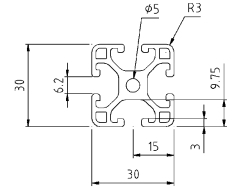 Series 6 profiles are generally based on 30mm core dimensions, with a 6mm slot that allows a maximum slot nut thread of M6, these profiles are used for larger applications such as furniture, table top frames and enclosures. There are a growing variety of other profiles in this series including new flat finish profiles. Again, the system has it's own extensive range of ancillary parts such as hinges, handles, slot nuts and connectors. Because the aluminium extrusion slot is 6mm, the maximum thread size you can use with this aluminium profile system is M6. Stronger that the series 5 aluminium extrusions, it can be used in more rigorous environments but for heavy duty applications we recommend the series 8 aluminium profiles. Series 8X30 profiles are versatile profiles offering the economy of 30mm dimensions with the flexibility of an 8mm slot for a wide range of connecting elements. 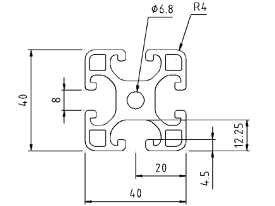 Based on 30mm core dimensions, with an 8mm slot that allows a maximum slot nut thread of M8, these profiles are used for a wide range of applications from frame building to machine guarding, from industrial enclosures to jigs and fixtures. 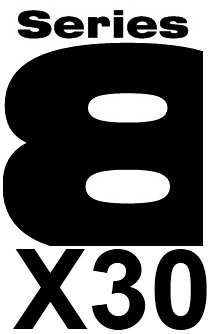 The series 8X30 profile family has not got as wide a range of aluminium profiles to choose from as the series 8 range. 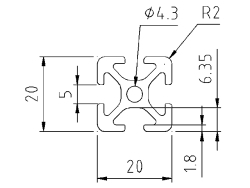 Therefore these profiles are normally used in quite basic applications. Series 8 profiles are the most popular, based on 40mm core dimensions, with an 8mm slot that allows a maximum slot nut thread of M8, these profiles are used for a vast range of applications from machine frame building to machine guarding, from special enclosures to vehicle structures. The series 8 profile family has the most aluminium profiles to choose from and the widest range of parts and connectors. For example in the most popular 40X40 profile size there are 3 derivatives based on weight and wall thickness of the profile, named standard, light and eco, in decreasing weight (And strength) order. We can help you choose the right profile for your project. 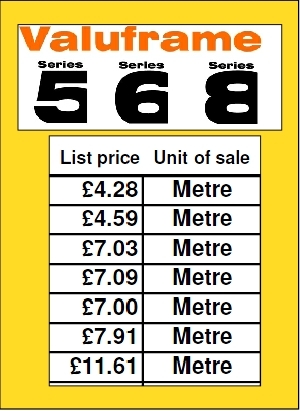 With Valuframe there are no minimum order quantities and low minimum order values. Your current aluminium extrusion supplier may have minimum pack sizes or bulk target prices. 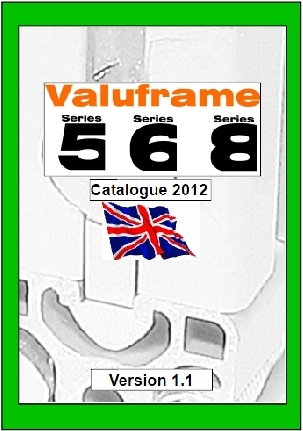 The Valuframe aluminium profile system is available from stock and a catalogue is also available to download. We value all our customers new and old, big and small. As leading aluminium extrusion suppliers, we don't believe that prices should be secrets, after all we work hard to make sure they are competitive, why not let you see them up front? 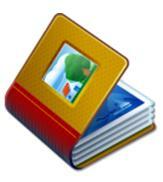 You are now able to download a price list for Valuframe by visiting the box at the base of every page. If you have a large requirement, then talk to us about discounts! Does your aluminium extrusion supplier provide that to you? A very competitive assembly service is available, but you can also order aluminium extrusions and parts in bulk or complete lengths to cut yourselves, or order a kit of cut to length profiles and parts for you to assemble. It's up to you. Design & technical help service. New to using aluminium profile systems? Give us a call to discuss your project. We can assist with your choice of aluminium extrusion system and connectors. It's an important decision and we want to help you get it right. Because our aluminium profiles and parts are all standard, it's easy and quick to have a drawing prepared for some larger projects. Aluminium profile frameworks are versatile and robust. 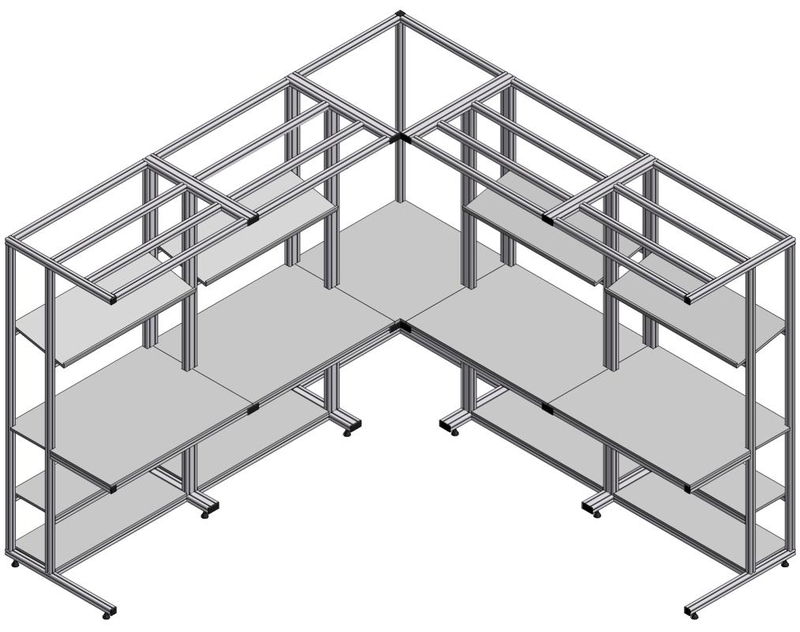 When connected correctly the aluminium structure is strong and can be quickly and easily reconfigured with basic tools. The standard length for most profiles is 6 metres and can be supplied in full lengths, or for a small charge the profile can be cut to size for you. This is worth considering because not only are cut aluminium profiles easier and cheaper to transport, it also means you get no wastage of profile that you can not use. On some of the larger profiles this wastage can be a significant factor to some customers. Compare other aluminium extrusion suppliers with what Valuframe has to offer.